Jack's funeral service will take place at Accrington Crematorium at 11.40am on Tuesday 23rd April followed by refreshments at his beloved Church & Oswaldtwistle Cricket Club. I am sending a message of condolences to the family of Jack Houldsworth from Noel Osborne. He played for CCC from 1962 to 1968 with Jack. Noel considered him a fantastic cricketer and true gentleman. He was very sad to hear of his death and sends his sympathy to his family. Jack Houldsworth's passing is a very sad moment for all those people whose lives he touched over many years. Jack was obviously a hugely respected person in his professional life and in the many cricket circles he was involved in. As an overseas player, my fondest memories are of the warm hospitality that Jack and his wife Sheila afforded me and my family in the chilly early weeks of each season. Jack's insightful opinions and subtle wit were a big part of my early education about the people and lifestyle of the Lancashire area. As a teammate Jack was an absolute rock for me year after year - well over 1200 wickets obviously speaks for itself, But to this day I still marvel at his ability to bowl well to so many big name professionals. At the other end I was often a nervous wreck. Of course he did all that as a very 'mature' player, but his competitive instincts ensured that he always found a way and was rarely beaten. Jack was a tireless servant for Church cc. His passion for the club and league were second to none, and I'm sure he gained great satisfaction from Church becoming one of the more successful clubs over the last decade as so much change in the structure of the league took place. Deepest condolences to Annette, Phil and Bethany Sykes, and to all those at Church CC. As has already been said, Wilky has got it spot on, I have been in Perth for 14 years , so haven�t seen Jack since I came here but I know from Bob Fishwick�s wife he has not been so good. Jack was everything any club could wish for, as has been said on or off the field. Maybee his HALVES of beer after a game and Thursday nights were his smallest contribution to the club but his others were MAGNIFICENT. REST IN PEACE, JACK. From watching him as a bowler in my teens, through to chatting with him last season about all things life and cricket, it was a pleasure to have known Jack Houldsworth. He loved our club like no other, loyalty like his is a rare thing. Thank you, Jack, for the way you conducted yourself as a member, both player and administrator, of Church and Oswaldtwistle CC, an example for us all. Difficult to add to Jim's fine tribute below. A sad loss. Jack was a true gentleman who put his heart and soul into the Club both on and off the field. It was a privilege to share a dressing room for 20 years or so with him. His bowling exploits are legendary as was his selfless dedication to the Club. Hopefully, he's now enjoying a deserved half of mild in some better place. Thoughts are with Annette, Phil and family. Below is a tribute from Jim Wilkinson to Jack Houldsworth who sadly passed away over the weekend. Anyone (friend or foe) who wishes to add tributes, please email information@churchcc.co.uk. 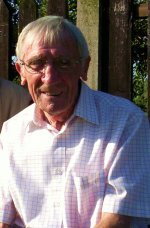 Church and Lancashire League legend Jack Houldsworth passed away suddenly on Saturday morning aged 83. Jack, who made his senior debut for the West Enders aged 19 in July 1955, took the first of 1246 league & cup wickets at Turf Moor that afternoon, claiming the scalp of the home side's Australian professional Chris Langdon and beginning a habit which he took delight in until his retirement from playing during the 1987 season, by which time he was 51 years of age. He is probably most famously remembered and celebrated for his stunning string of performances during the 1974 run to Worsley Cup success, Church's first and to date only occasion lifting the trophy. In the four games up to and including the final against Nelson he bowled unchanged in tight, low-scoring thrillers (more than 68 overs in total), taking five for 51 versus East Lancashire, five for 42 against Haslingden, six for 31 against Accrington in the semi-final and six for 24 against Nelson in front of Church's partisan home supporters in the final. His dismissal of explosive Nelson professional Collis King, bowled, was possibly the most pivotal and iconic moment in the club's history. It was a sweet triumph for a player who had initially struggled for a decade to cement a place in a well-established side and missed out completely as Church won the League for the first time in peacetime in 1962. In his first ten years as a player at the club he had, ironically, been selected only once to play in the Worsley Cup competition. From 1955 till 1966 he could hardly ever be described as a regular first-teamer, 16 games in 1960 the only time he figured in half the games. It was, as former team-mate Eric Barnes wrote in a club publication, a long apprenticeship." But this fiercely loyal one-club man simply carried on putting in endless hours of practice and learning all he could about the game and the craft to hone his art to the point where his mastery of right arm medium-paced seam bowling could not be ignored any longer. And in that summer of 66, remembered for many things but not often cricket, he played 23 times in the league, breaking the 20-wicket mark for the first time. After another in-and-out season in 1967, he finally hit his straps - aged 32 now, remember - in 1968 when he passed the mark of 50 Lancashire League wickets, 64 in all, for the first time. He was to reach that mark nine times in the subsequent 11 campaigns, 76 in 1969 (93 including cup games) and 74 in 1975 his greatest numerical hauls. He was leading amateur wicket taker four times, took 84 five-wicket hauls in league and cup and had five against every other league side home and away with the exception of Haslingden against whom he once had four wickets before the match ended early with a controversial walk-off by the visitors! In the 1980's, his body ageing but his appetite for practice as voracious as ever, his hauls were more often in the thirties and forties but there was the notable landmark of a thousandth league wicket and a glorious swansong in 1986 when he chalked up his tenth 50-wicket haul now past the age of 50 himself. Jack's batting and fielding were never remotely comparable to his bowling and as the game began to move towards the athletic pursuit for fit young men and women it is today, it was time to make way for more youthful blood,an inevitability he accepted part way through the 1987 campaign He had taken 1246 wickets in 595 league and Worsley Cup appearances. But that was merely the beginning of another long and loyal tenure as committee man, club press secretary, league rep and, as importantly as any, stalwart worker helping a yeoman team transform the West End from the rather downbeat, tired, oft sneered at by opposition ground of past decades into the splendidly curated and well-appointed cricket field with attendant classy facilities it enjoys today. When the call inevitably came to serve on the Lancashire League Executive Committee, it was with some reluctance that Jack initially accepted the responsibility, concerned that it would diminish his ability to contribute fully to his own club. But of course he simply made twice the time and worked diligently in both causes. He was made a Life Member of the League but had left the Executive committee before the recent changes to the league which as a traditionalist he was fiercely opposed to. Respected and admired by all he played with and against, his reputation as a master bowler was genuinely worldwide. He would have probably been able to tell you exactly how many Test players he'd played against, how many he dismissed but possibly not how many hours he'd spent in earnest, mutually-admiring conversation with top-class cricketers from all around the globe, not to mention local fellows old and young who played for Church or the opposition whom he mentored and counselled down the decades. Even in his eighties, still lean with his dark mane greying but largely intact, he was instantly recognisable with his walking gait still reminiscent of his walk back to his mark before turning to deliver that smooth, economical action. He was lovingly welcomed on all the other league grounds. Legend, icon and giant are words used cheaply in sport these days but as far as the rich tapestry and history of Lancashire League cricket and Church and Oswaldtwistle Cricket Club are concerned, Jack Houldsworth truly was all three. This year the Club will be holding its NatWest Cricket Force Day on the morning of Saturday 6th April starting at 9am. As usual we have a great team of volunteers who prepare the ground all year but this is a time we need your help to get the ground ready for the season, so any help on the morning would be greatly appreciated. All Stars Cricket is the England and Wales Cricket Board�s entry level participation programme, aimed at providing children aged five to eight with a great first experience in cricket. Church CC will be running All Stars Cricket for 8 weeks on Wednesdays from 22nd May 2019 to 10th July 2019 from 6.15pm to 7.15pm. The emphasis is on fun and being active and the programme will focus on developing your child's movement skills. The programme is safe and fully accredited and every child that registers will receive a backpack full of goodies including a cricket bat, ball, activity book, personalised shirt and cap all sent straight to your door. The full cost of the programme, including the backpack and contents, is �40 per child. This season we�re introducing a new A to Z feature designed to help you learn a little bit more about the lads representing our club. The idea is simple: 26 questions, one for each letter of the alphabet. First up we have the club joker, Cameron Dawson! This can be found in the Information section of the website. Click here to view. Members can now pay membership subscriptions by debit or credit card through this website. The facility is available on the Membership page. 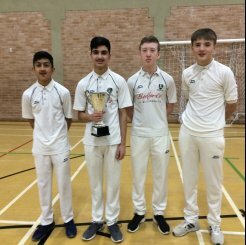 Congratulations to our U-15's side which won the Hyndburn Cricket Indoor Competition today. Well done to Nathaniel and Jack who also played but missed the photo opportunity. We will have indoor cricket training at Accrington Academy on Sundays from March 10th-31st inclusive. The junior training will be 10am till 11am and the seniors 11am till 12 oclock. Church are delighted to announce the signing of Dayyaan Galiem as Professional for the 2019 season. Dayyaan is from Cape Town, South Africa and is a top order batsman and pace bowler. In 2016 and at the age of 18 Dayyaan made his 1st class debut for Western Province. He previously represented South Africa at U19 level and in first class cricket he averages over 30 with the bat whilst his 53 first class wickets are at an average of 28. A genuine all rounder Dayyaan is an outstanding prospect and Church look forward to welcoming him to the Club. Church would like to thank Rob Humphries of World Sports Xchange for his help in this matter. I played for Church & Oswaldtwistle cricket club in Lancashire league cricket and Worsley Cup in 1968 & 1969. I am now 74 years old and still working. After I left England in 1970 went to Pakistan and then in 1974 moved to New Zealand ever since living in New Zealand. A beautiful country. I had some great memories of playing with the club and made some great friends like Jack Houldsworth, Steve Metcalf and of course Bob Fishwick and Bill Heys. I am very sad to read about both of them. I remember, we were so close to winning Worsley Cup (1968 I think ?) and needed only one run when Bill Heys shattered our dreams by being clean bowled first ball that he faced and we lost by one run. There are many more stories like this that I can tell. Please give my best regards to Steve and Jack and all. I will always cherish these memories. It was good old days. I am planning to visit UK soon and ensure to visit my old club. A match report has been penned for the Rawtenstall game on Saturday - courtesy of Jim Wilkinson. Hopefully, further contributions may follow. This can be found in the Match Reports section of the website or by clicking here. Due to the unforeseen weather conditions the event will now take place on Friday 27th April at Green Haworth Golf Club. Geoff Miller OBE has kindly agreed to honour the event and will still be our headline speaker on the 27th April. We would like to apologise for any inconvenience this may have caused and we would be grateful if you could confirm your attendance for this new date. This year's AGM will be held on Monday 19th February at 7.30pm in the Clubhouse. Junior Cricket training will start at Accrington Academy on Thursday evenings 5.45pm-6.45pm from 1st March to 5th April 2018 (excluding 22nd March). Senior Cricket training will start at Accrington Academy on Thursday evenings on 22nd February when it will be a 2 hour session 5.45pm-7.45pm and every Thursday thereafter until 5th April 2018 when it will be 6.45pm-7.45pm (excluding 22nd March). Junior Cricket training will take place at Accrington Academy on Thursday evenings 5.45pm-6.45pm from 22nd February to 5th April 2018 (excluding 22nd March). Senior Cricket training will be at Accrington Academy on Thursday evenings 6.45pm-7.45pm from 22nd February to 5th April 2018 (excluding 22nd March). Church are pleased to announce the signing of Johnny Riekert as Professional for the 2018 season. Johnny is from Durban in South Africa and is a top order batsman and medium pace bowler. Johnny made his 1st class debut in the summer 2015-16 for Kwa-Zulu Natal and has experience of playing in England as Professional at Euxton in 2017 where he scored over 800 runs. Johnny is a qualified coach and he is keen to help develop and coach junior and senior players at the Club. Church would like to thank Rob Humphries at World Sports Xchange for his help in this matter. Our Annual Presentation Night for both senior and junior teams will take place after the last match of the season on Sunday 10th September. The Junior Presentation will start at 7.00pm, to be followed by the Senior Presentation. It is with great sadness that we report the passing of our supporter and friend Stuart Williams. Stuart's funeral will take place at 11am on Wednesday 26th July at Immanuel Church, New Lane, Oswaldtwistle followed by burial in Immanuel Churchyard and a reception at Church CC to celebrate Stuart's life. Bob Fishwick's funeral will be held at Accrington Crematorium at 11.40am on Wednesday 12th April, and afterwards at Church CC. It is with great sadness that the Club announces the passing of Honorary Life Member and former player and captain, Bob Fishwick. Bob was a member of the Church Championship winning side of 1962 and during a Lancashire League career spanning over 20 years he scored 3346 league runs and took 342 wickets. During his lifelong association with the Club, Bob was also a dedicated member of the Committee and loyal supporter of our teams, regularly travelling to home and away matches with his wife Eva. Bob will be sorely missed by all his friends at the Club and our thoughts are with Eva, Robert and Susan and their families at this difficult time. This year the Club will be holding its NatWest Cricket Force Day on the morning of Saturday 18th March starting at 9am. As usual we have a great team of volunteers who prepare the ground all year but this is a time we need your help to get the ground ready for the season, so any help on the morning would be greatly appreciated. We are very sad to announce that our Honorary Life Member Mr Les Powdrill has passed away. Les was a life long supporter of the Club and will be fondly remembered and greatly missed by everyone at Church CC. His funeral will take place at Holy Trinity Church, Oswaldtwistle, at 10am on Tuesday 21st February followed by a reception at Church CC. We are excited to announce that ex England cricketer and local legend Graeme Fowler will be our guest speaker at the Club's Annual Sportsmans Dinner on Friday 24th February. In addition to this, celebrity impressionist Mike Maguire, who is taking the comedy circuit by storm will be an excellent addition to the evening. Sponsorship packages are now available, which start from �100 (including 2 tickets) and additional tickets cost �32. The event will once again be at Green Haworth Golf Club. For further details or to purchase tickets please contact Sam Tucker 07764770900 - samuel.tucker@me.com. Junior Cricket training will take place at Accrington Academy 5.45pm-6.45pm on 16th February, 2nd March, 9th March, 23rd March, 30th March and 6th April. Senior Cricket training will be at Accrington Academy 6.45pm-7.45pm on 16th February, 2nd March, 9th March, 23rd March, 30th March and 6th April. The AGM will be held at the Clubhouse on Tuesday 21st February 2017 with a start time of 7.30pm. Philip Sykes, Chairman, thanked Mr Jones for his substantial financial donation and sponsorship of the Club, part of which is to be used to improve junior cricket facilities at the Club. In recognition of their on field success in 2016, trophies were presented to the players and Captains of the first X1 for their T20 triumph, the third Xl for League runners up, the U/11's as both district indoor champions and Division 3 Champions and the U/9's for League Division 2 runners up. Thanks also went to Craig Fergusson, who after 6 years as Club Captain has decided to step down. In his six years at the helm Craig not only led his team to the Club's first senior trophy for over 40 years, the Club also had five top 5 League finishes in the League and in all competitions the first Xl won 115 matches suffering only 65 defeats, which is probably one of the highest win ratios of any captain in the Club�s history. The ongoing support of volunteers has continued to transform the Club's financial position and thanks went to all those who have helped the Club during the year. Special praise went to the parents for their continued support of the Club and to the juniors themselves for both their commitment and on-field success. The prizes were presented by special guest Dave Jones and in the photograph he presents Jack Lancaster with the U-11 Championship Trophy with other prize winners in attendance. After six seasons at the helm Craig Fergusson has informed the Club of his wish to step down as Captain. Church Chairman Philip Sykes said "During his six years as Captain, Craig has presided over what has been a very successful period for the Club; not only did he lead the first XI to the Club's first senior trophy for over 40 years, he also lead his team to five top 5 League finishes in the League. In all competitions over the last six years the side won 115 matches suffering only 65 defeats which is probably one of the highest win ratios of any captain in the Club�s history. The captaincy is a huge undertaking requiring considerable commitment both on and off the field and the Club appreciates and thanks Craig for all his effort and hard work during the last six seasons." The Club has appointed Levi Wolfenden as Captain for the 2017 season. Our Annual Presentation Night for both senior and junior teams will take place after the last match of the season on Sunday 11th September. The Junior Presentation will start at 7.00pm, to be followed by the Senior Presentation. Church Cricket Club is delighted to announce that Zain Abbas will return to be for the 2017 season. The Club would like to thank Abid Riaz at Proelite Sports for their help. It is with great sadness we announce the passing of our Honorary Life Member and former player, Bill Heys. Bill�s funeral will be at St Anne�s RC Church, Cobham Road, Accrington, at 10.00am on Thursday 2nd June. In his memory his family have requested no flowers but donations to Cancer Research c/o Hyndburn Funeral Service. Bill made a huge contribution to the club for nearly 70 years, his long association with the Club beginning back in 1949 when he made his senior team debut at the age of nineteen. His talents as a wicket keeper quickly alerted counties, with Bill eventually signing for Lancashire in 1955 and he was on the County�s book for four seasons and in that time he played five 1st Class matches. After being released by Lancashire County Cricket Club in 1959 Bill returned to Church and continued playing for the Club until 1970. He established a then club record of 326 career victims; a record which stood until 2012. Bill also played a key role in Church�s 1962 Championship side with 28 victims and 399 runs. Following the conclusion of his playing career Bill remained a loyal supporter of the Club, through good times and bad, and he contributed a huge amount of time to help Church, serving on the Committee, helping out on the ground, assisting with machine maintenance and being a friend to all those connected with the Club. Everyone knows of Bill�s passion for the game of cricket, his willingness to help others and his unfailing support of his Club. Bill will be dearly missed by all at Church and our sympathy goes out to Maureen, Simon, Fiona and family. I had the pleasure of first meeting Bill in 1952 when I was selected for Church U-18�s whilst he had commenced his 1st Xl career a few years earlier in 1949 and that first meeting led to over 60 years of friendship. Bill was a jovial man, never a hard word for those around him and he was immensely proud of his family. Bill had a long memory for all his cricket experiences and as a wicket keeper he was an artist. No smashing down the wickets, Bill would simply remove one bail. Bill had the privilege to 'keep' to Fred Hartley, a master of flight and length, and what a combination they must have been. Bill was very proud to be part of the Church League Championship winning side of 1962 and played such a key role in this success keeping wicket and also with valuable runs. Bill held the Club wicket keeping record for over forty years until it was broken in recent years by Sam Tucker. It is a testament to Bill�s personality that no one was more pleased for Sam than Bill himself who took great delight in seeing a youngster coming through the ranks and achieving what he himself had done all those years ago. Bill, thank you for your friendship and all the happy memories. You will be missed not only by me but all at Church CC. 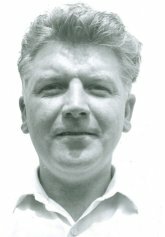 For someone who followed Lancashire League cricket from the age of nine years old in 1968 and who has been associated with Church CC since 1981, it�s difficult to think of Bill Heys not being around the club any more. One of my very earliest memories of cricket was a match in 1969 at East Lancs, the club my granddad, dad and I supported, when the home pro Pat Trimborn hit Church�s Ghulam Abbas for 32 off an eight-ball over in somewhat contrived circumstances. From memory, I think East Lancs were batting out time for a draw � ironically, a somewhat �lost art� of the time cricket game which Bill would later lament and discuss at length ('nothing better than the young lad at number ten holding out for a few overs,' he'd say) � and the visiting captain decided to throw a carrot to maybe get the Meadows men to go for a chase and maybe lose some wickets to make a game of it. I think Trimborn was out of the last ball of the over having gone from 18 to 50 in seven deliveries and the game was drawn in any case. It wasn�t a game that would otherwise stick long in Bill�s memory � he got a duck and took no victims that afternoon � and in truth he was nearing the end of a distinguished career. But even more vividly than Trimborn�s hitting, I remember the afternoon as one I got laughed at and given a talking to by my dad and granddad. I used to religiously collect the players� autographs in those days, amateurs as well as the pros, and when Bill was seventh Church man out without scoring and the innings was declared, I ran round to the pavilion steps to ask for his signature, probably on my programme/scorecard. I was too young to realise that the moments after a dismissal are probably the least likely time to find a cricketer feeling generous enough to pause and sign a scratty bit of paper for a kid. It was another decade or so before I discovered that the default reaction was usually to curse and complain about umpire, pitch, non-striking batsmen or whoever or whatever else you can apportion blame for your downfall to before hurling your bat at the door. Bill, however, was fortunately the last player to react thus and he signed obligingly and patted me on the back whatever other emotions he was feeling or how keen he was to get his tea before kitting up and going out behind the stumps. In the tea room shortly after, my dad and granddad explained to me that it might in future be best to wait a few minutes before issuing such a request and looking at the Church line up that day with the previous batsmen including messrs Metcalf S, Osborne, Wilson, Briggs and Wilkinson W, it was perhaps my good fortune to present my gauche request to such a genial soul who I would later be proud to consider a friend! I�d be at the Meadows too a year later then on Church as Bill was winding his career up, he only played two further first XI games late in the season after that. I missed Bill�s only Lancashire League 50 by a few months, he made that at The Meadows, opening the innings, in 1967, less than a year before my father took me along to see Clive Lloyd and I was bitten by the bug for life. Of course you�d have to speak to his contemporaries such as Jack Houldsworth, Bob Fishwick and the players mentioned above to hear what a good player and fine gloveman he was. His senior debut came as an 18-year-old in 1949 and a look down the list of professionals he shared the field with that year - Bill�s team mate Fred Hartley, Hazare, Dooland, Bill Alley, Cec Pepper, Fred Freer � tell you that the kindly, smiling white-haired chap never far from the ground, busying himself there through the week or on matchdays, chatting at the bar on a Thursday night, was a living link to history itself. Make no mistake, the post-war years were a golden age for freedom itself, never mind just for sport which the nation was once again able to enjoy in numbers never to be equalled and embrace without fear or threat. Of just short of 350 league and Worsley Cup dismissals, more than a quarter were stumpings which tells you that this was a craftsman of the art of wicket-keeping. In 1957, Bill was selected on five occasions for the Lancashire First XI, twice against the legendary Calypso King West Indian tourists of Ramadhin and Valentine, Walcott, Weekes and Worrell fame with a couple of up-and-coming kids named Sobers and Kanhai in their ranks. Incredibly, my research tells me that in one of his three County Championship games, Bill appeared for Lancs with another old family friend of ours, Ted Kelly of Chorley, who also made his only handful of first-class appearances in the same year. Ted, now deceased, still used to still proudly wear his Lancs short-sleeved sweater tearing in fearsomely and bowling out poor lads for Star Paper in the Blackburn Midweek League in the late 1970�s and while there was nothing as overtly showy about Bill�s pride in having worn the Red Rose, it was an achievement all of us who love and cherish the game and the feats of league cricketers respect: going on to the next level and testing yourself against the very best, indeed. It�s something we�d all swap a great deal to have had the talent to do. My own friendship with Bill came about when I came to play at Church in 1981. Almost instantly I was playing alongside Simon, a good enough player to make more than 50 First Team appearances for Church, mostly behind the wicket, and emulate his father�s tally of senior half-centuries and a lifelong pal. I'm proud that in a couple of dusty old scorebooks there'll be a couple of "ct Heys B Wilkinson" dismissals. By this time Bill was a perennial presence at the ground and in the club-house, always smiling, encouraging, cajoling but never overbearing or unduly critical. My enduring memory of him will always be of a smile and a cheery greeting, some good chat and a sense that while it�s a game to be taken deadly seriously and worked damned hard at, it is also a pursuit to be enjoyed and relished both while you�re playing, working hard on making the place fit for others to play and while enjoying the company of team-mates, opponents and officials after. Of course as Rovers fans as Bill, myself and many others associated with Church are, it�s often hard work remembering that maxim but there were good times at Ewood among a large contingent of closely-knit �West Enders� for many years too. A couple of years ago, Bill was trying to recall a player from the past, and said, metaphorically scratching his head: �You know....what was his name ....half back (pronounced �hay-fe back� of course)?� I thought Bill, with such an archaic term, was referring back to maybe his 40�s or 50�s youth and some long-forgotten �wing half� such as Clayton, McGrath or Nudger Campbell. It turned out he meant Tim Sherwood. That was Bill. A link with a time now sepia-tinted on old photographs but still interested enough and sufficiently enthused to remain infectious and engaging company. I�ll really miss him although my visits to the WECG aren�t as frequent these days. As the song goes, sometimes it�s nice to go �where everybody knows your name� and when I do go, I miss many of the folks I could always rely on for a �hail fellow, well met,� like Alan Gilrane Snr, Terry Ashton and Bill, who I still enjoyed calling me �Wilky,� whenever he spotted me. Click here for junior fixtures for 2016. The club is saddened to announce the passing of lifelong member Ronnie Brandrick. 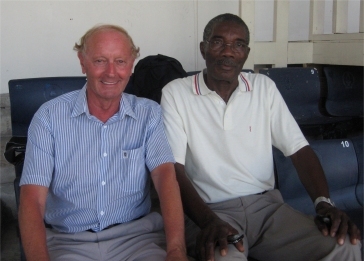 Ronnie was a well known character at Church and for many years helped maintain the ground. The funeral will be held at Accrington Crematorium at 3pm on Thursday 14th April, followed by drinks at Church Cricket Club. 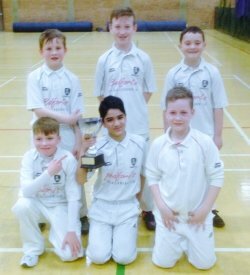 Congratulations to our U-11's team, Indoor District Champions 2016. Well done to Muhammed, Toby, Harris, Matthew, Chris and Jack. This year the Club will be holding its NatWest Cricket Force Day on the morning of Sunday 3rd April 2016 starting at 9am. As usual our brilliant 'Ground Crew' volunteers have been working hard all winter. However, due to the bad weather over recent months there is still a long list of jobs which need to be done in order to get the ground ready for the season so any help on the morning would be greatly appreciated. Lancashire League Clubs have been asked to attend a meeting on Wednesday 13th January to discuss the Expansion of the Lancashire League. In order that Members/Players can have their say the Proposals have been summarised below and members can email information@churchcc.co.uk with their views or ring 01254385094 to discuss. The LCB have now outlined three proposals and these are in addition to the League�s own initial expansion plan. While considering these Proposals the League is looking to obtain clear guidance from the Clubs as to which Proposal(s) the Clubs wish to pursue and therefore you are now invited to provide your views and preference. At this stage we ask that you do not worry about the finer details as to, who runs the league, what the league is called, playing conditions/rules/amateur registration/fixture details for T20, Saturdays or Sundays as the Lancashire League is only looking for an overall strategy at this stage. This sees the Lancashire League and Northern Premier League merging in the first year to form one Division and Clubs play each other once. After the first year final placings between the combined Lancashire League/Northern League will confirm Division 1 and Division 2 places for the 2018 season. Division 3 and Division 4 will be made up of Ribblesdale League Clubs and Palace Shield Clubs. A more locally based format for 2nd team cricket will be preferred. This Proposal can be viewed in more detail on the Ribblesdale League Facebook page and involves the final league placings for Clubs across all four leagues (Lancs League/Northern League/Ribblesdale League/Palace Shield) determining places for Divisions 1-6 for the 2018 season. Lancashire League Clubs would start in either Division 1 or 2 dependent on their league placing. This format involves Division 1 Clubs playing against Division 2 Clubs similar to the current Ribblesdale League arrangements and therefore ensures derbies are maintained. Again a format where 2nd team cricket is regionalised is considered the preferred option. Lancashire League is Division 1 and its feeder league is the Ribblesdale League which forms Division 2. Promotion and relegation between these two leagues only. This involves expansion of 6-10 Clubs to form 2 Divisions with new Clubs being chosen from applicants. LCB refused to accept this plan as in their opinion the LCB did not consider this would be in the best interests of League cricket in the County as both the Northern League and Ribblesdale League could be placed in jeopardy. The ECB/LCB recommend a League structure with Promotion/Relegation where Clubs can find their level and progress. In addition Lancashire League clubs have expressed their intent to expand and create two Divisions with Promotion/Relegation however, by default, if no agreement can be reached on how to proceed there will be no change. 1. Proposal 1 � If you have discounted this Proposal due to the travelling distances involved could you please express a preference as to what travelling distances you would find acceptable i.e. Northern League less Cumbrian Clubs a geographical limit set at Morecambe, or would you set the limit at Fleetwood, Leyland or other? 2. One final area the Club Committee would like guidance on is whether you consider the Club should express a preference on these Proposals in isolation considering the views of its own Players/Members only? Or would you consider it important that the Club considers the views of other Clubs and does not vote to support a specific Proposal if it could lead to another Lancashire League club either questioning its future in the league or actually leaving the league due increased travelling for that particular Club? Please either e mail your views or ring 01254385094 to discuss. Senior indoor cricket training will take place on Thursday nights commencing 3rd March until 31st March, 7.30pm - 9pm at St Christophers in Accrington. Due to availability of the Sports Hall at Accrington Academy we have had to switch Junior Indoor Cricket training to Wednesday nights. Junior cricket training will commence on 10th Feb until 30th March from 5.45pm to 6.45pm for those junior players in School Years 2, 3, 4, 5, 6, 7 & 8. Outdoor junior cricket training will as usual take place on Thursday nights once the season starts. For junior players in School Years 9, 10 & 11 practise will commence on Thursday nights commencing 3rd March 7.30pm - 9pm until Thursday 31st March at St Christophers in Accrington. Our junior teams will take part in the Hyndburn District Indoor Cricket League. The Competitions will again take place at Hyndburn Sport Centre on Sunday afternoons and we are still awaiting the dates. Tuesday 12th January 1.30pm at Our Lady of Perpetual Succour RC Church, Pilmuir Road, Blackburn. Burial will take place at Pleasington Cemetery and drinks/food afterwards at Knowles Arms, Pleckgate Road, Blackburn. It is with great sadness that we report the passing away of Tony Marsden, past Chairman of the Club. During his time as Chairman, Tony was one of the hardest-working individuals you could ever meet. For many years, he seemed to spend his life at the Club and, at times, carried it single-handedly. He was an absolute pleasure to work with, had a heart of gold and an immense sense of humour, and he will be greatly missed. He leaves behind though many happy memories as recalled in the tribute below from Jim Wilkinson. Tony was a strong, loyal and devoted family man, friend and clubman for Church CC. I came to join and play at Church having walked into a Headingley pub during a rained-off Roses match in 1980 and encountering a bunch of lads from Church, some of whom I vaguely knew, Tony among them. At a time when most of my pals had gone off to Uni, I knew after an hour that these were a bunch of guys I wanted to spend more time with, the sense of fun and camaraderie was really special and Tony was always at the heart of that. I�ve never known to this day whether Tony ever actually played cricket as a junior but just a first couple of hours in his company and you knew that he had an unmatched passion for the game and particularly his club and a generosity of spirit to warmly welcome into the close-knit fold an outsider looking for a new �family,� even a duffer who would never play above second XI level. There will inevitably be reminiscences of innumerable hilarious incidents and adventures which he was invariably involved in, often along with his long-time compadre Phil Lee. The two of them were almost in the class of Morecambe and Wise as a double act. It was a brave man who tried to out-quip them when they were in full flow and a very foolish one who attempted to do so while trying to match them pint for pint. So many laughs � Tony and Malcolm Kenyon sleeping overnight in the barbecue marquee on the ground in 1981 to guard the beer and equipment, inevitably receiving an early morning visit from the rest of the boys returning from a night out: an uproarious day out watching Lancashire in a quarter final at Lords; the end-of-season �picnic� ride-outs which were worthy of a six-part TV sitcom series in themselves. As a fellow Rovers fan, Tony was more a kindred spirit than most and while I will never forget the laughs and remember him at his jolliest, he had a deadly serious and focussed side when it came to the betterment of the club. In truth, the Church I arrived at in 1981 was a ramshackle, down-at-heel ground with ageing teams. 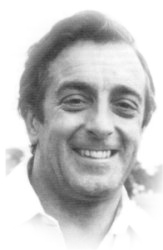 Tony was a breath of young, fresh air on a similarly old-fashioned committee and I am sure his wisdom, willingness to graft and encouragement was a great help to people like Brendan McArdle, Steve Metcalf and Ian Osborne in modernising the approach and raising standards on and off the field. You would have to speak to first teamers of the day to confirm that but whatever needed doing, Tony was there to do it and encourage and cajole others into doing so. I remember him reporting to Old Trafford at some ungodly hours on Sunday mornings to attend Pete Marron�s ground clinics. I remember thinking he was amazingly young when he took the chairman�s position but he carried out his duties with the energy of a young man but also the gravitas and seriousness of one more advanced in years. I recall helping Peter Hacking organise the legendary tours of 82, 83, 84 � basically the young, single lads at the club going off on holiday with a cricket game or two pencilled in, While many of the grandees on the committee were horrified at the prospect of such a motley bunch carrying on outside the county bearing the club badge, Tony gave his blessing with a stern proviso � �Go and enjoy yourselves but you two are responsible and woe betide anyone who lets the club down,� kind of thing. No one really did. While he was a witty, funny fella with a wicked turn of phrase who would join in any fun, he could also let you know with an arching of the eyebrows and a cautionary change of expression if he thought you�d gone too far or stepped over the line. A withering put-down from Tony would leave you crestfallen but knowing damn well you must have richly deserved it. He could let his hair down with the best of them but he had a tough, steely hard-working ethic and determination to see the cricket club succeed a little more. When things gradually took an upturn on the field I know how much satisfaction and pride it gave him � I think we finished fourth with Peter Taylor as pro which would mean more to Tony, Church through and through, than his beloved Rovers winning the league. The ground we see and are so proud of now, one of the best in the league, was brought up to scratch and beyond by him and the fabulous streamed-down but far more efficient team of committee men and volunteers which emerged in those years. I�m so glad he got to see it � and I'm told that despite his failing health you would sometimes catch Tony parked up at the WECG early of a morning � before his illness took hold and kept him housebound for so long. I know Tony had health problems even before I met him and the last thing he deserved having overcome a great deal was to be struck down by a condition which hospitalised him on so many occasions. For such a sociable and naturally outgoing soul it must have been hard to lose contact with many of his great pals. His wife Barbara and daughter Julie were his pride and joy and looked after him dedicatedly and only they will know how much he missed his past life during those many years. I remember how happy he�d been when I pulled a few strings with a mutual pal and got Colin Hendry to come round to the door unannounced and present a very young Julie with a signed birthday gift. He�d carried on getting to Ewood as long as he was able. In later years, I would see an odd comment he�d put on his Facebook site encouraging the Church lads for big games. He�d put up an odd photo of his late parents and his brothers on occasion, ever the family man marking anniversaries and such. And I was very touched that after having my own family, I�d get a Tony Marsden �like� for anything I put up to do with them. Although he couldn�t get out to see us, he was still, after all these years, looking out for his boys and keeping an eye on what we were up to. Cricket Clubs and leagues can ill afford to lose stalwarts like Tony, there are very few coming through who will have that amount of time, knowledge and dedication, and it was cruel that he was unable to continue to contribute as he had as a younger man in his latter years. My thoughts are with Barbara and Julie. Knowing what a tremendously loyal clubman and friend he was and the values he showed, he must have been quite some father and husband. As we get older, raising a glass to the comrades we've lost becomes a more frequent curse. I'm sure Tony would have liked us all to raise a very full one together to him......and then maybe a couple more! Please click here for details of 2016 Sportsmans Dinner. Church Cricket Club would like to thank Usman Tariq for his significant contribution to the Club over the last two seasons. Not only has he made a major impact on the field scoring over 2,000 runs and taking over 100 wickets he also helped the Club secure its first silverware in over 40 years. Usman's attitude to the game is an inspiration to others and we wish him all the best for the 2016 season at his new Club Flixton CC. The Club is delighted to announce that the new Professional for the 2016 season will be Zain Abbas, a 23 year old left handed opening batsman/right arm bowler. Zain has just had an outstanding year in the Bolton League scoring 1350 runs at an average of nearly 90. He is the leading run scorer in the Bolton league and he broke the batting record at Little Lever CC, a record that had stood for 21 years. In 22 league innings Zain scored 5 centuries and 8 half centuries. Zain will live local to the ground next season and he is looking forward to helping develop the cricket talent at the club. He will be available to coach at both junior and senior cricket practise and he will run the popular summer cricket coaching camp week in August next year. Our Annual Presentation Night for both senior and junior teams will take place after the last match of the season on Sunday 13th September. The Junior Presentation will start at 7.15pm, to be followed by the Senior Presentation. After making an impressive debut for Staffordshire, scoring 22 & 44 and taking 4-36, Levi Wolfenden has been selected to play in Staffordshire's next County Championship Match starting on the 21st June. Church will entertain Salesbury in a T20 friendly starting at 6.15pm on Friday 22nd May. Outdoor practice for juniors will commence on Thursday 23rd April and will take place from 6 - 7.30pm. There will be no charge for junior practice nights and junior membership fees remain unchanged at �30 for the season (any cheques should be made payable to Church & Oswaldtwistle Cricket Club). We will be running U9, U11, U13 and U15 teams. Our U-9 side will once again be a joint side with Oswaldtwistle Immanuel CC. Our U-15 side has been promoted to Division 2 this year and will be a joint side with Great Harwood CC. Please note the first match of the U-15 season will be played at Great Harwood but all other home games for the U-15 side will be played at Church CC. 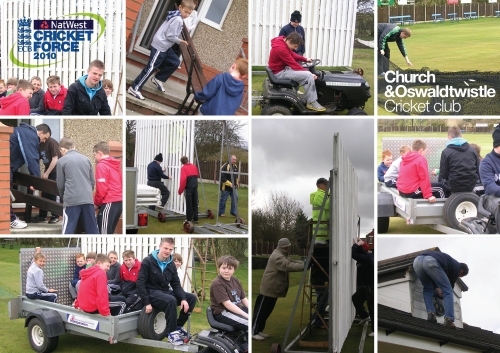 This year the Club will be holding its NatWest Cricket Force event on the Thursday 9th April. Please come along and help. Richard Arkwright Austin, a former professional at Church and Enfield has died at the age of 60. Richard was an international cricketer from Jamaica who played two tests and a One Day International for the West Indies. Richard was professional at Church in 1978 and returned to the Lancashire League in 1982 to play for Enfield. Church & Oswaldtwistle Cricket Club are looking for scorers for the senior teams for the 2015 season. With pre -season friendlies, league and cup matches there will be a minimum of 35 first team matches in the season, which runs from mid April until September; matches (home and away fixtures) usually take place on Saturday/Sunday afternoons although we do have some T20 matches on Friday evenings. Transport to away fixtures can be arranged if necessary. Although experience of scoring is preferred, training can be provided if necessary. Scoring would suit a person looking for a new interest and with time on their hands, any age considered. This is a great opportunity to earn extra money and become involved with this friendly & sociable Lancashire League Club. Anyone interested should contact the Club on 01254 385094. The AGM will be held at the Clubhouse on Thursday 19th February 2015 with a start time of 7.30pm. Junior Cricket training will start on Thursday 22nd January at Accrington Academy at 5.45pm to 6.45pm for those junior players in School Years 2, 3, 4, 5, 6 & 7 and will take place every Thursday until the 2nd April. For junior players in School Years 8, 9, 10 & 11, junior practise will commence on Thursday 29th January 6.45pm � 7.45pm. Senior cricket training will commence on Thursday 26th February 6.45pm to 7.45pm until 2nd April at Accrington Academy. The Annual Sportsmans Dinner will be held on Friday 27 February 2015 at Green Haworth Golf Club. Click here for details. On behalf of the family, Kathleen Walmsley and Judith Bury would like to thank everyone connected with Church and Oswaldtwistle Cricket Club for their support at the funeral of their mother Kitty Ward. They would also like to thank everyone for the cards, donations and words of kindness offered to them at this time of sadness. Donations on behalf of Church and Oswaldtwistle Cricket Club and North West Air Ambulance are still being received by both Kathleen and Judith along with the Funeral Directors � Hyndburn Funeral Services. The family hope to post further information about donations received in due course. We are very sad to announce that our life member and dear friend Kitty Ward has passed away at the age of 94. Kitty, wife of our late Chairman Tom Ward, was a life long supporter of the Club and she will be fondly remembered and greatly missed by everyone at Church CC. This will commence on Thursday 22nd January at Accrington Academy 5.45pm. More details will follow. Our Junior Teams will once again be taking part in the indoor cricket competition at Hyndburn Sports Centre and for the first time there will be a District Indoor U-9 competition. Our Annual Presentation Night for both senior and junior teams will take place after the last match of the season on Sunday 14th September. The Junior Presentation will start at 7.15pm, to be followed by the Senior Presentation. Church Cricket Club will again be holding its popular Summer Cricket Coaching Camp from Monday 4th August to Thursday 7th August from 10am -3.30pm. For further details or to book a place please contact Philip Sykes on 01254 385094 or email pjsykes@talktalk.net. Click here to read about the entertainment provided by the Club during 'Red Hot June'. Junior training will again take place every Thursday during the season and will start on Thursday 24th April at 6pm. The friendly match against Radcliffe on Sunday 6 April has been cancelled. This year the Club will be holding its NatWest Cricket Force Day on the morning of Saturday 12th April 2014. We aim to start at 9am and the more helpers we have the quicker the jobs will be done! Even if you can only spare an hour or two it would really help the Club and we look forward to seeing you at some stage during the morning. Due to work commitments, Stephen Stokes has advised the Club that he will unfortunately not be able to captain the second team for the forthcoming season. Stephen still hopes to play when he is available and the Club would like to thank him for all his efforts. Luke Gilrane will now be the captain of the second team for the 2014 season and Danny Dyson will be the Club's third team captain. On 22nd February husband and wife coaching team, Mark and Naomi Aspin, will head to Sierra Leone for 2 weeks to undertake charity work under the sponsorship of Manchester based Charity 'Make It Happen in Sierra Leone' where they will both coach cricket to the local community in the capital, Freetown. If you have any unwanted items of cricket and sports clothing or equipment, please contact Mark Aspin to arrange collection/drop off of donations 07931 246538 or email mark.aspin1@btinternet.com. Senior Teams: Indoor nets for the Club's senior teams will commence at Accrington Academy on Thursday 20th February 7-8pm, and will continue every Thursday until the 3rd April. Junior Cricket (U/9, U/11 & U/13): Indoor nets for juniors is due to start on Thursday 16th January 6-7pm at Accrington Academy and will continue every Thursday until 3rd April. Junior Cricket (U/15): Indoor nets for our U/15 players will commence on Thursday 6th February 6-7pm at Accrington Academy and will continue every Thursday until 3rd April. U/11's competition is on Sunday 2nd March 2014 (start 2pm with the Church team in Group A with matches against Enfield & Rishton). U/13's competition is on Sunday 16th March 2014(start 2pm in Group A with the Church team in Group B with matches against Gt Harwood & Rishton). U/15's competition is on Sunday 23rd March. Two teams from Church will be taking part with the Church U/14's side in Group A playing matches against Enfield and Rishton and the Church U/15's team in Group B with matches against Accrington and Gt Harwood). For all the competitions there will be a final to decide the competition winners with the Group A winners playing the Group B winners. There will also be a 3rd/4th place play off between the Group runners up. It is with sadness that the Club must inform members of the death of a former player, Paul Lowe who played at the club from 1972-1979. The family wish to invite those that knew him and played cricket with him to attend the funeral at Hillside Methodist Church, Brinscall at 12.30pm on Tuesday 3rd December and to Pleasington Crematorium at 1.30pm. The family also offer an invitation to come along to Brinscall Cricket Club after the funeral. Click here for details of the Annual Sportsmans Dinner to be held on Friday 28 February 2014. Church CC are pleased to announce that the Professional for 2014 season will be Usman Tariq. This follows the move of Ashar Zaidi to Sussex County Cricket Club on a two year contract. A left-hand top order batsman and right-arm off spin bowler Usman Tariq has excelled in his native Pakistan since his List-A debut at just 13 years of age. Usman, now 29, has scored over 10,000 runs in 1st class and List A matches including 3 double hundreds, 17 hundreds and 62 fifties. In 1st class matches Usman has also taken 78 wickets at an average of 30 runs per wicket Usman, a former Pakistani Under-19 player, has an impressive record and is an experienced and established league Professional. In the last 8 seasons as Professional for Greenmount, Radcliffe and Walkden he has scored 9489 league runs at an average of over 56 and taken 310 wickets at an average of 18 runs per wicket. In those 8 seasons Usman has scored over 1,000 league runs on 6 occasions with seasons highest of 1639 runs for Greenmount in 2006 and 1476 runs at Walkden in 2010. During this period Usman has also played County 2nd XI matches for Lancashire, Surrey and Sussex, where he scored a century in the last match he played for the County. Club secretary Andrew Bentley said "We are delighted to have signed a player with such a pedigree in both 1st class and league cricket and look forward to welcoming him to the Club. Everyone at Church would like to wish Ashar all the best for his time with Sussex CCC and also thank Sussex for the way they have handled the matter, in not only keeping the Club fully informed throughout, but also for their donation to the club which will be used to develop junior players at the Club. Lastly I would also like to thank Steve Hirst at CricX, the Cricket Exchange Agency, for his help in this matter". There will be no changes in the captains at Church for the 3 senior teams with Craig Fergusson captaining the 1st team, Stephen Stokes the 2nd's and Luke Gilrane the 3rd's. Our LCB Cup 1st Round home match against Accrington has been arranged for Friday April 18th. Church had the Senior and Junior Presentation Night following the last game of the season on Sunday. Andy Aspin was the "Guest of Honour" for the evening presenting the prizes to the award winners. Andy emigrated to Australia several years ago but returned to England for a holiday to watch his sons play for Church for the closing matches of the season and in the picture Andy is joined by team mates from his playing days at Church. Click here to view the list of prizewinners. Our Annual Presentation Night for our senior and junior teams will take place after the last match of the season on Sunday 8th September. The Junior Presentation will start at 7.30pm and the Senior Presentation will commence at 9pm. Church have agreed terms for the 2014 season with Ashar Zaidi. Church Captain Craig Fergusson said: "The Club is delighted to have secured the services of Ashar Zaidi for next season. Ashar has consistently been one of the top performing Professionals in the League over the last three years and he has had a remarkable season, helping Accrington secure their Championship success and currently being both the leading run scorer and wicket taker in the Lancashire League". Church Cricket Club will again be holding its popular Summer Cricket Coaching Camp from Monday 5th August to Thursday 8th August from 10am -3.30pm. Coaches involved will all be ECB qualified coaches and the Church cricket professional will oversee all coaching on each day of the Coaching Camp. Mrs Susan Crook has kindly presented Church Cricket Club with two benches in memory of her late husband Jimmy Crook. Susan is pictured during the Club's recent home game against Rishton with friends and members of the Church 'Barmy Army'. Our 1st Round match at Farnworth Social Circle will take place on the Bank Holiday Monday, 6th May with a 1pm start. Saturday 6th April is the Club's Cricket Force Day which once again is kindly being sponsored by NatWest. There is a long list of jobs still to be done to get the ground ready for the season so any help you can provide would be greatly appreciated. The Tractor Boys will be down at the ground for 9am, tractors at the ready! Please spread the word and we look forward to seeing you at some stage on the day. Our outdoor practice night for juniors will be on Thursday nights and will commence on 11th April at 6pm. The 2013 Junior Fixtures can now be viewed online on this website via the "Information - Junior Fixtures" navigation button. 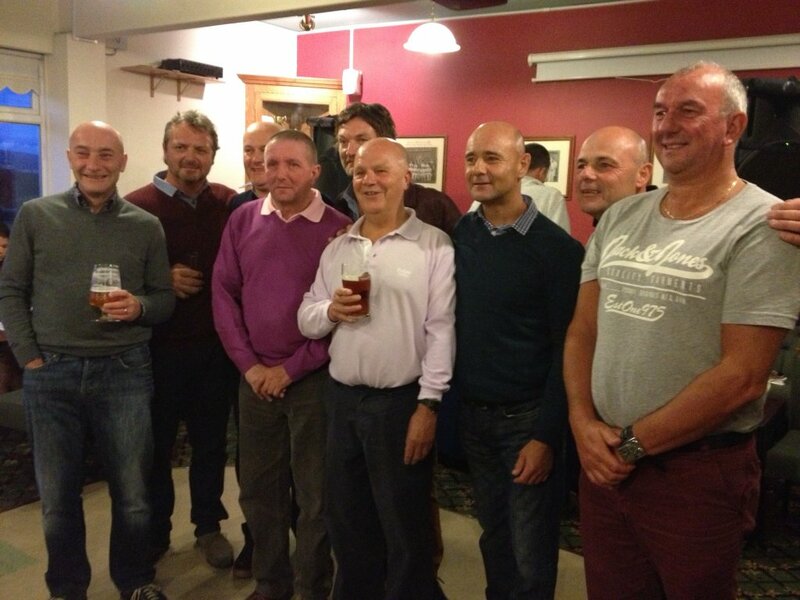 Former England cricketer Paul Nixon was the main speaker at Church Cricket Club's Annual Sportsmans Dinner. The event took place at Green Haworth Golf Club and during the evening Paul Nixon spoke of the cricket match fixing scandal that has been such a controversy in recent years. Comedian Jamie Sutherland entertained guests with Tony Alveston as Master of Ceremonies. Alan Gilrane said "I would like to thank everyone who attended and in particular our sponsors and Tony Alveston for all his efforts." Members may be interested in this five minute film clip of the derby game between Accrington and Church in 1902. Can anyone spot Jack Houldsworth? Click here. Following this week's successful launch event, our new Club shop is now available online and the complete range of Club team and leisure wear can be purchased direct, all year round. Click here. We are delighted to announce that we will be holding a launch night at the Clubhouse at 7pm on Tuesday 19th February to unveil our new Club kit, and kit sponsor, for 2013. Representatives from the kit suppliers will be joining us on the night and samples of the kit will be available for players and members to try on and then order. On the evening we will also be launching a new online Club Shop which will enable players, members and supporters to purchase customised team kit and leisure wear direct from the suppliers all year round. The range of leisure wear will include polo shirts, tracksuits, hoodies, jackets and caps. The event should be of interest to all our members and we look forward to seeing you all on the evening. We are deeply saddened to announce the passing of our long time supporter and friend, John Hesmondhalgh. John, who passed away peacefully earlier today, will be remembered with great affection and will be sorely missed by his many friends at the Club. John's funeral will take place at 1.30pm on Monday 28th January 2013 at Ernest Street Baptist Chapel, Walmsley Close, Church, Accrington BB5 6HP followed by cremation at Accrington Crematorium. Family flowers only please but donations, if so desired, to Parkinson's UK North West in memory of John will be gratefully received. John's family would love his many friends to join them at Church Cricket Club from 3pm onwards to share happy memories and to celebrate John's life. The Annual General Meeting will be held in the Clubhouse on Thursday 7th February at 7.30pm. It is with great sadness that the Club must inform members of the death of our long standing supporter and Life Member, Roden Andrews. 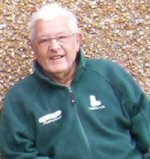 Roden, who supported the Club for over 60 years and served on the Committee, will be fondly remembered and greatly missed by all his friends at the West End Cricket Ground. The main speaker, David Fulton, is now unavailable and has been replaced by ex Leicestershire & England wicketkeeper Paul Nixon. Indoor practise for Church CC will take place at Accrington Academy on Sundays from 17th February for a 6 week period up to and including 24th March, with juniors practising 12pm - 1pm and seniors 1pm - 2pm. In addition the juniors will again be taking part in the Hyndburn District Indoor Cricket Competition and the dates are as follows: U-15 3rd February, U-13 17th March, U-11 24th March. Accrington & Rossendale College students have teamed up with Church Cricket Club to redecorate the Clubhouse. The project involved the repainting of the interior of the Clubhouse at Church & Oswaldtwistle Cricket Club. Dulux have kindly sponsored all materials for this project through their "Colouring the Community" scheme. All the work has been carried out on a voluntary basis by the students of the Painting & Decorating Department at Accrington & Rossendale College. In total over 20 students, who are on the second year of their course, have been involved in the project and have worked under the supervision of their course tutors. The project will not only benefit the Club and the local community in improving the standard of decor in a widely used facility but it will also be of huge benefit to the college students who have volunteered to undertake the work. Many of the students have never had an opportunity to use the skills they have learned on their College course on a real job "offsite" and this has provided the opportunity for them to do so. Simon Whitaker the course tutor at Accrington & Rossendale College said, "It has been a great opportunity for the students to get some hands-on experience. This project has helped the students develop and practice the skills they have learned in the classroom. In total we have been able to involve over 20 students in this project and they have all benefited from this." Andrew Bentley, the Club Secretary said, "The Club would like to thank all the help it has received from Accrington & Rossendale College. They have done a fantastic job and have finished all the redecorating works to a great standard. In total over 20 students have been involved in this project over a two week period and this gives some idea to the amount of work involved. Everyone at the Club really appreciates all the students' efforts. In addition, the Club would also like to thank Dulux for kindly sponsoring all the materials used in this project and the local Dulux centre in Blackburn for providing their support." Church CC will be holding their 30th Annual Sportsmans Dinner on Friday 22nd February 2013 at Green Haworth Golf Club in Accrington. This year, former Kent cricketer and Sky Sports reporter, David Fulton, and brilliant comedian, Jamie Sutherland, will be the guest speakers. Tickets are �30 each and, if you wish to come along to this popular event, please contact Alan Gilrane on 07973 439557 or email at.gilrane@ntlworld.com. Church Cricket Club are delighted to announce the signing of Kasun Bodhisha as their professional for the 2013 season. Kasun, an opening left handed batsman and slow left arm bowler, is the second Sri Lankan cricketer to sign for Church, following in the footsteps of Ruvin Pieris who was at the Club between 2004 and 2007. Kasun has played 53 first class matches and scored over 4,000 runs and also has 5 years experience playing in English cricket leagues. During the last two seasons at Hartlepool Cricket Club, Kasun scored 2169 runs and took 104 wickets. Andrew Bentley said, "We are delighted to sign such an experienced and talented cricketer and we look forward to welcoming him to Church Cricket Club. The Club would like to thank Rob Ashwell from Ashwell Cricket Exchange for all his help in arranging this." All help would be greatly appreciated on Saturday September 15th from 9am onwards to prepare the ground for the close season. Our Annual Presentation Night for our senior and junior teams will take place after the last match of the season on Sunday 9th September. The start time will be 7.30pm and food will be available. The club aims to start preparing and getting the ground ready for Sunday's Worsley Cup final on Saturday morning. If you can spare any time please come along and help. People will start arriving and commence our preparations on Saturday from 8am onwards as we need to start early as the first team are at home later in the day. The Fosters Worsley Cup Final v Lowerhouse will take place on Sunday 12th August commencing at 12.30pm. The club will be providing extra bar facilities, refreshment and BBQ. Normal tearoom service will be available but no pre-order service. Please note that ground car parking will be limited. Lagers, beers and wine will be available at competitive prices to complement our usual club bar facilties. ONLY ALCOHOL PURCHASED ON THE GROUND MAY BE CONSUMED ON THE GROUND. We hope that this informnation will help us to provide an enjoyable day for all supporters. Your help and support will be much appreciated. Church beat Accrington in a high scoring semi-final and will host Lowerhouse in the final on Sunday August 12th. Various sponsorship packages are available. Click here for further details. Church have been drawn away at Accrington in the semi final of the Worsley Cup which will be played on Saturday 30th June. The winners of this tie will host the final on Sunday August 12th. Church will host Haslingden in the Lancashire League Twenty20 competition on Friday after winning the Group stage. Church Cricket Club will again be holding its popular Summer Cricket Coaching Camp from Monday 23rd July to 26th July - 10am -3.30pm. Coaches involved will all be ECB qualified coaches and the Church cricket professional will oversee all coaching on each day of the Summer Camp. For further details or to book a place please contact Philip Sykes on 01254 385094 or 0750 1250736. Church entertain Great Harwood in a T20 friendly match this Friday 25th May at the West End Cricket Ground. The match will be free admission and will commence at 6.15. Bar open until late. Church & Oswaldtwistle Cricket Club officially unveiled its refurbished scorebox complete with new electronic fascia before the derby match with Accrington on Monday. The scorebox was opened by Geoff Briggs, a lifelong member and ex player of the club, who kindly made a generous donation which allowed the works to be completed. The Club is also grateful to Senator plc for donating stools and materials and HML Recycling for their help. The friendly v Leyland on Sunday 8th April has been cancelled. This year the Club will be holding its NatWest Cricket Force Day on Saturday 31st March 2012. We aim to start at 9am and the more helpers we have the quicker the jobs will be done! Even if you can only spare an hour or two it would really help the Club and we look forward to seeing you at some stage on the day. A reminder that senior training begins this Sunday (19 Feb) 1-2pm at Accrington Academy. Fitness training in preparation for this has been led by Russ Bury at Tempest Training on Friday evenings 6.30-7.30pm. This will continue right up until the start of the season. Any players aged 15 and above are encouraged to attend. For more info, contact Andy Bentley on 07846 106343. Levi Wolfenden will captain the side for the friendlies as Craig Fergusson is away on holiday. Church's first appearance in the Lancashire Knockout Cup Competition will be on Saturday 21st April at Westhoughton. The winners of this tie will have a home fixture in the second round. Christmas Cheer starts here with our Festive Get Together - Sunday 11th December! By way of a thank you to all our members and supporters, for one day only, we will be selling cheap beer and there will be free mince pies for as long as they last! Also free soft drinks for our junior players. Its an opportunity to come and catch up with friends! The club will open at 12.30pm and football will be on our big screen for the afternoon starting with Sunderland v Blackburn Rovers at 1.30pm. 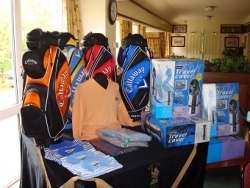 The 2012 Sportsman�s Dinner, organised by Alan Gilrane, will take place on Friday 24th February 2012 at Green Haworth Golf Club, tickets �30. The guest speaker is Matthew Hoggard MBE and entertainment will, once again, be provided by comedian Josh Daniels. If you would like to help in any way or simply want to join us on the night please contact Alan on 07973439557. Senior training has now been arranged and will commence on 19th February 1pm � 2pm at Accrington Academy and will run for 6 weeks. Indoor junior training will start on 22nd January at Accrington Academy at 1pm and will run for a 10 week period to 25th March. For the 1st four weeks the junior training sessions will be 1pm � 2pm and for the next 6 sessions starting from 19th February the sessions will run from 2pm � 3pm. The AGM will be held at the Clubhouse on Thursday 23rd February 2012 with a start time of 8pm. Following a successful 2011 season, the Club will, for the first time, take part in the Lancashire Knock Out Cup. Our opponents in the first round are Westhoughton Cricket Club and the fixture will be played at their new ground which boasts a �1million clubhouse! Westhoughton have recently benefited from huge investment following the sale of their former ground to Sainsburys and the facilities are such that they now host Lancashire County Cricket Club second team matches. The date of the fixture is yet to be arranged but keep watching our website for further details. The Club has got a bye in the Worsley Cup first round draw for 2012. Church's Annual Presentation evening for Senior and Junior players will be held in the Clubhouse at 8pm on Friday 28th October. Church have re-signed Saeed Anwar as professional for the 2012 season. Saeed has played a big part in the team's success on the field in 2011, with the team not only reaching the Worsley Cup Final but also looking set to achieve its highest league position since 2002. The Cricket Chairman, Stephen George, announced that he is delighted that the club has secured the services of Saeed Anwar for next season. Saeed is an excellent professional and one of the top performers with both bat and ball in the league this season. Saeed has also played a big part in off-the-field activities, coaching at the club and in local primary schools. This has played a part in boosting the number of junior members at the club in conjunction with the considerable amount of time and effort our other coaches have devoted to this. The Church CC Lottery �1,000 draw will take place on Sunday 11th September at 8.30pm following the final game of the season. Its been 37 years since our club had the privilege of hosting this annual showcase event and excitement is building nicely with just over 2 weeks to go until the big day. Preparations within the club are progressing well for an event that is likely to see the biggest spectator attendance on the ground in the club's recent history. Sponsorship and hospitality packages are still available for any organisation looking to support the club and use this fantastic event to get some publicity for their business. Please see website landing page or info@churchcc.co.uk for more information and we will endeavour to accommodate your requirements. We look forward to seeing you on Sunday 7th August for what promises to be an exciting and memorable event. Additional bar and food facilities will be available on the day. Ex Church Professional Luke Woodcock will make a sensational return to his former club for the Worsley Cup semi-final, but this time on the opposing side. Woodcock who was club professional at Church throughout seasons 2009 & 2010 is now professional at Nelson Cricket Club, the club whom we have drawn a home semi-final tie. Woodcock returned to the Lancashire League following a productive winter featuring in the 2011 ICC Cricket World Cup for New Zealand. Church progressed following a nail bitting climax to the quarter final against Haslingden at Bent Gate. A 1 wicket victory with 4 balls to spare kept everybody on the edge of their seats before Adam Greenwood crashed the decisive boundary through extra cover to evoke jubilant scenes from the travelling supporters. Church CC v Nelson CC - Sunday 3rd July, 1pm start. Last Sunday marked the start of the 119th Lancashire League season. Church played host to last year's double winners Ramsbottom and, despite a disappointing result, the WECG saw a big spectator presence enjoying the early season sunshine. Church will be hoping to make amends in this weekend's crucial double header, at home on Saturday to Colne and away on Sunday to Enfield. The live scoreboard will be in operation for the opening game of the season against Ramsbottom at the WECG on Sunday. This feature provides users with an authentic scoreboard and a detailed scorecard plus other visual information including run rate, worm, manhattan and partnerships. The 1st XI have prepared well and are feeling confident ahead of the opening match against Ramsbottom. The team have enjoyed a successful pre-season campaign with victories against Leyland, Cherry Tree and Stand with the majority of players making the most of their opportunities. The final friendly match on Saturday away to local rivals Accrington provides players a final opportunity to impress new skipper Craig Fergusson ahead of the season opener on Sunday. Win, lose or draw - celebrate the opening of the new season on Sunday evening in the club after the match. It's an ideal opportunity to have one too many sherbets until the early hours with no work Monday morning! Finally, we would like to take this opportunity to welcome our new professional Saeed Anwar Jnr to the club and wish him all the very best throughout his time at the club. ECB TWELFTHMAN "THE BIG CLUB COMP"
NatWest has been a supporter of cricket for over 30 years at all levels. To show their appreciation for cricket volunteers who have helped at NatWest CricketForce they have teamed up with TwelfthMan (the Official Fan Community of England Cricket) to provide our club with the opportunity to win some of these great prizes. SO PLEASE NOW DO YOUR BIT FOR OUR CLUB BY ENTERING "THE BIG CLUB COMPETITION" PRIZE DRAW. To enter, simply register online at ecb.co.uk/twelfthmancomp. Once you have entered please spread the word among all your friends/relatives/neighbours - the more entries we have the more chance we have of winning the prizes! Saturday 9th April is the Club's Cricket Force Day, which once again is kindly being sponsored by NatWest. Please spread the word and we look forward to seeing you at some stage on Saturday! Graham Thorpe was guest of honour at the 28th Annual Church Cricket Club Sportsmans Dinner on Friday evening. He entertained a packed room of guests at Green Haworth Golf Club with great stories of touring with England, memorable Ashes encounters and many of the great characters he has met throughout his illustrious 17 year career as a professional cricketer with Surrey & England. Guests were also entertained by the brilliant comedian Gary Marshall in what was a highly successful evening for the club. A big thank you to all the sponsors who kindly supported this event. Our indoor winter nets for both Seniors and Juniors start on Sunday 20th February for a period of 6 weeks. Senior training will commence at 1pm - please contact first Xl captain Craig Fergusson on 07763 292680 if you require any further information. Junior training will be 2pm until 3pm - please contact Graham Gaskill on 07762 490090 if you require any further information. Happy New Year to you all. We do hope you all had a wonderful festive season! For those that attended our New Years Eve fancy dress party, it proved yet again to be a great night as we partied into the early hours of 2011 with an array of fantastic costumes! Photographs can be viewed on the club's Facebook fan page. We would like to wish you all the very best for 2011 and look forward to seeing you prior to a long hot summer! Church�s Senior and Junior Presentation Night was held at the club on Friday night. 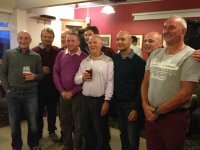 The event, which was well attended, also celebrated the club�s achievements in 2010, including the 1st XI being finalists in the Twenty20 Cup competition and the 2nd XI winning both the League and Cup competitions. In addition, two personal milestones were achieved with Ammer Mirza breaking the amateur batting record and Sam Tucker breaking the all time club record for wicket keeping victims. Click here for a full list of all the prize winners. There will be some changes on the field for the 2011 season with Craig Fergusson taking over as first team captain from Andrew Bentley. Andrew and his partner are expecting their first child in the spring of next year and together with the fact that Andrew will also be studying for exams next summer, Andrew felt he would be unable to give the same amount of commitment to the role as he has done in the last 12 months. The club would like to thank Andrew for all his efforts both on and off the field. After an outstanding season as leading run scorer in the league, Ammer Mirza has also been offered an engagement in the Bradford League in 2011 and will play at Undercliffe. Ammer is currently in Australia playing cricket and the club wish him every success. The presentation evening will take place next Friday 29th October from 8pm. All players, families and supporters are welcome to attend to celebrate the club's achievements on the field this year. A short quiz will take place on completion of the presentations which is free to enter. Church Cricket Club is delighted to announce the signing of Saeed Anwar as professional for the 2011 season. The 31 year old Pakistan cricketer has been a most consistent all round performer over a number of years in both the Lancashire and Central Lancashire Cricket Leagues and brings a wealth of experience to the Club. Apart from 2009, Saeed has played local league cricket since 2002 and during that time he has amassed 7994 league runs and 470 league wickets. As professional at Rishton Cricket Club in 2007 and 2008, he made a total of 2933 runs and 156 wickets in just two seasons. Club captain Andrew Bentley said "Saeed has been one of the most consistent all round performers in local league cricket for a number of years and we are looking forward to welcoming him to Church for the 2011 season. We feel Saeed will make a big impact both on and off the field and that with him as professional Church will, hopefully, be in a position to challenge for honours. He has also asked to be involved at all levels of junior coaching and is especially keen to assist our youth players in making the transition into the senior teams. Saeed recognises the talent at the Club and is confident that with his contribution and input Church will improve on this years� fifth position in the league. As the Club looks forward to welcoming Saeed to Church next year it would also like to recognise and thank the outgoing professional Luke Woodcock for his contribution to the Club over the last two seasons". A Quiz Night hosted by our very own quizmaster Graham Gaskill will take place in the club on Friday 1st October from 8PM. 5 people max per team, �2 per person to enter. Supper available. The final draw for the 2010 club lottery will take place in the clubhouse after the final game of the season on Sunday 12 September at 8.30pm. The prize is �1000. 2010 will go down as a memorable year in the colourful history of Church Cricket Club following a hugely successful season for our 2nd Xl. Joel Gaskill's men have delivered much needed silverware into the West End Trophy Cabinet after securing the league championship on Sunday over East Lancs. Another solid batting display early in the day yielded in excess of 250 runs and laid the platform for yet another comprehensive victory. Church stalwart and league representative Jack Houldsworth had the pleasure of presenting Gaskill with the trophy on home soil on conclusion of the match. The Championship Trophy will sit proudly next to Lancashire Telegraph Cup which was won earlier in the season following victory over Bacup in the final. Church 2nd XI go into this weekend knowing that a win will secure the 2nd XI League Championship for the first time since 1991. Joel Gaskill's men are currently 16 points clear of second place Nelson with two games to play and will be looking to avoid any final day drama by securing victory at home to East Lancs on Sunday. 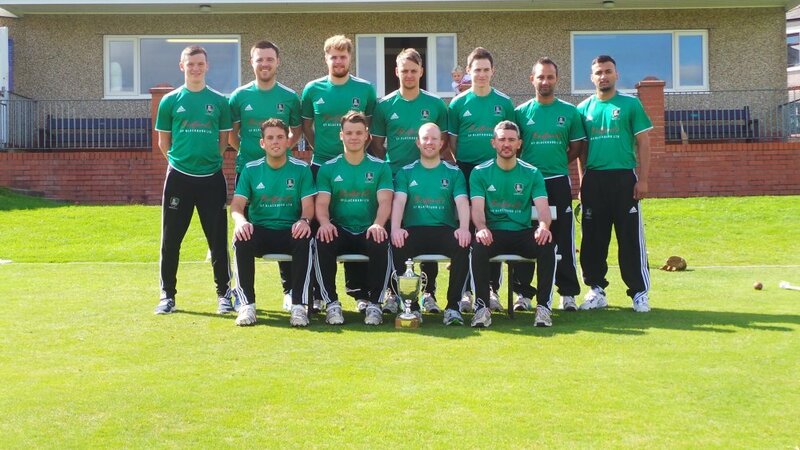 As an added incentive, this season's 2nd XI could enter the record books as the first ever senior Church side to complete the league and cup double following victory over Bacup in the Lancashire Telegraph Cup final earlier in the season. Graham Thorpe signs for Church for one night only! England Cricket legend Graham Thorpe has been announced as the speaker for the 2011 Sportsmans Dinner on 18th February at Green Howarth Golf Club. Highly rated comedian Josh Daniels will also feature as part of the evening's entertainment. For more information or sponsorship and ticket reservations please contact Alan Gilrane on 07973 439557. Church professional Luke Woodcock is back from his exploits with the New Zealand emerging squad in Brisbane in time for the remaining 4 games of the season. Woody will join up with his team mates again prior to a vital double header weekend as Church bid to secure their highest league position in 6 years. Currently sitting in 4th place, 8 points behind East Lancs in 3rd, the club have a rather difficult run in with the top 3 clubs yet to play after a tricky home tie against local rivals Accrington. There is a rare cricketing feast of action coming up at West End with three matches over the weekend. On Friday night it's free admission when we entertain Oswaldtwistle Immanuel in our annual 20:20 challenge match. There is a Cup Final on Saturday with the Lancashire Telegraph trophy at stake. Our second team entertains Bacup, looking to lift a trophy that we have only won on one previous occasion. This match will start at 12.30pm. Bacup have already booked a bus service to transport their supporters to our ground so please come along, we need your support to make this feel like a home game! Finally, on Sunday our first team are in action when we entertain Bacup. Former Zimbabwe international Gary Brent will fill the vacant professional role for Church at the weekend. The former Enfield paid man will lead the quest to continue good league form at home to Rishton on Saturday and away to Nelson on Sunday. Brent takes over from Settle professional Harry Boam whose solid all round performance as sub pro helped the club to victory over Enfield last weekend. Lancashire Girls Under 17s play Cumbria Girls Under 17s in a 45 overs a side game at Church on Thursday 29th July starting at 11.30am. The teams played each other two weeks ago at Haverigg CC and the Lancashire Girls won a close game by 5 runs. Since the opening game of the season when they lost to Yorkshire, the girls have been unbeaten. The Twenty20 Final between Church and Ramsbottom will be played at the West End Cricket Ground next Friday 9th July following victory in the semi-final last Friday against Edenfield. Church will be looking to emulate the success of the 1974 Worsley Cup winning side who defeated a Nelson team featuring West Indian test player Collis King and were incidentally the last senior Church team to benefit from home advantage in a cup final. The last time the two teams met in a cup final was in 2002, when the Worsley Cup Final was contested at Acre Bottom and featured high profile Australian professionals Michael Clarke and Mark Higgs. Church will be looking to avenge the 2002 defeat by continuing the good form which has so far produced 5 wins out of 5 in this season's Twenty20 campaign. An exciting evening is in prospect as the match yet again lives up to the Lancashire League legacy of featuring high profile professionals, our very own Luke Woodcock from Wellington and the Ramsbottom professional Francis Du Plessis. The club looks forward to welcoming the players, officials and supporters of Ramsbottom Cricket Club on the evening. Twitter is a social networking and microblogging service that enables its users to send and read other user messages called tweets. Tweets are text-based posts of up to 140 characters displayed on the author's profile page. Follow Church CC on Twitter for regular tweets on a diverse range of topics and links to other cricket related information the club finds interesting. Official Church Cricket Club twitter page: twitter.com/ChurchCricket. 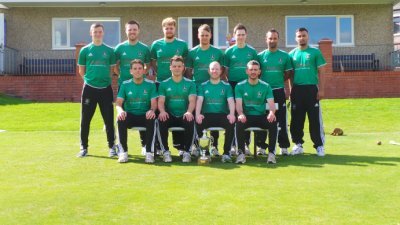 Church to host Twenty20 semi-final for second consecutive year! Another solid performance from the boys last Friday night completed our group campaign with a fourth successive victory and thus progression to the semi-final stages as group leaders. Friday night will see the club look to avenge last year's narrow semi-final defeat to Burnley as they take on Edenfield at the West End Cricket Ground. Another big night in prospect as the Friday night Twenty20 party atmosphere embraces the club yet again. Selected drinks offers available, World Cup quarter final action on in the bar, music outside until late and hopefully more good weather will deliver a night not to be missed. International teams now allocate unique numbers to players on debut. Not to be outdone, the club has now allocated unique player numbers to all past and present First XI players. Full details of this can be found in the special brochure located at www.churchcc.co.uk/images/churchvengland brochure.pdf. To view or download the player list, go to www.churchcc.co.uk/images/church_player_list.pdf. The club has also made available a link between each Church Player and the England player with the equivalent number. This can be accessed at www.churchcc.co.uk/images/churchvtest.pdf. Finally, the club announces a competition called 'The Church v England challenge'. We have selected the test cricketers who have played for Church, and paired them with the England player who shares their number. You are invited to select the better player in each case. To enter the competition, either download the special brochure and print and complete the entry form and hand in at the club bar, or enter online at www.churchcc.co.uk/competition.asp. The competition is just for fun! Friday night will see a potentially defining moment in Church�s season as they take on Enfield in their final group match at the WECG. Church currently sit top of the group with maximum points from 3 games with destiny firmly in their own hands as they look to secure their place in the T20 semi-final for the second year running. Defeat for Church and victory for Accrington over Rishton on Friday would more than likely see the club pipped to the post on run rate. Church will look to re-produce the same form they have shown in their opening 3 games but this time without their inspirational leader Andrew Bentley who will be absent for the evening. Take advantage of the evening sunshine and carnival atmosphere with plenty of drinks offers and food available with the World Cup also being shown in the bar. Church has launched a live scoreboard feature on their website which will allow users to view an authentic live scoreboard as well as a detailed scorecard, ball by ball information and other interesting features such as run rate, manhattan, partnerships and worm. The club also intends to add individual batting wagon wheel information in phase two. Church hopes to have this feature available for all Lancashire League and Worsley cup fixtures going forward starting with their re-arranged home fixture to Todmorden on Saturday. This feature is a welcome addition to the website following recent completion of the club's entire statistical archive which is also available online. Next Thursday's training is cancelled owing to the Twenty20 at Accrington being played on Thursday evening rather than Friday evening as England are playing in the World Cup against Algeria. The bar is open, drinks deals available!!! Newly qualified Level 2 coach Naomi Aspin will continue her rapid development this week as she watches over the Lancashire Girls Under 11's in their first fixture at Rainhill Cricket Club on Merseyside. Naomi, known to some within the club as "Coach", worked tirelessly during the winter to prepare the clubs U11's and U13's for the new season, and completed her Level 2 ECB qualification at QEGS in April along with U15's coach Graham Gaskill and current 1st XI opener Ammer Mirza. No doubt the experience gained throughout the summer with Lancs will be passed on to the club's junior and senior players as all teams look to make progress. The club are looking for new boys and girls to represent their U11's, U13's and U15's teams and any players interested in joining can come down on Thursday evening from 6-8pm. Contact info@churchcc.co.uk or call Graham on 07762 490 090. Professional Luke Woodcock arrived in Oswaldtwistle last night after another interesting journey saw him spend an unexpected 5 days in Los Angeles en route to the UK. There wasn't a Visa problem in sight, just the small matter of an erupting volcano which delayed Luke's arrival but having been provided with accommodation and food by New Zealand Air his brief stay in the USA wasn't all bad. Luke arrives on the back of a hectic but successful season in which he broke the Wellington first class batting record and after 3 weeks off, can't wait to get started. The senior squad play a 40 over practice match at West End on Saturday (stumps pitched 1pm) with full bar and tearoom facilities available. Woodcock will not be playing but will instead undertake sub pro duties for Great Harwood at Edenfield in the Ribblesdale league. With the 1st XI travelling to Bacup on Sunday, and with 3 wins out of 3 in pre-season friendlies, the boys have reason to be optimistic and will be hoping for a successful weekend to kick of the new season. Our team of volunteers consisting of senior and junior players, club coaches, members and friends of the club were able to build on all the hard work and preparation our team of volunteer ground staff have put in throughout the winter months by assisting with some of the difficult pre-season preparation work. Jobs undertaken included erection of practice nets and sight screens, distribution of spectator benches and seating around the perimeter of the ground, erection of advertising boards, and cleaning of tea room to name a few. We thank Natwest for its continued support and look forward to seeing you throughout a long, hot summer at the Church Cricket Club. Church Professional Luke Woodock fell just short in his attempt to become only the sixth player in history to score 1000 runs in a New Zealand first class season. Needing 85 runs in the final first class match, Woody notched 71 not out in the first innings but sadly fell for 2 in the second as Wellington pushed for quick runs. Woodcock scored 988 runs in his 20 first class innings this season at an average of 65.86. This included 1 century and 7 fifties with a top score of 220*. In the process he passed the mark of 888 set by Robert Vance in 1988/89 to become Wellington Cricket all-time single season highest first-class run scorer. He also became the first Wellington player ever to pass 900 runs in a first class season. All at Church would like to congratulate him on his tremendous effort and look forward having Woody in Oswaldtwistle for the start of the Lancashire League season. Church play at Atherton in a pre-season friendly on the 10th April, and at Radcliffe the following day. They then entertain Enfield on the 18th April before a mixed 1st XI / 2nd XI match rounds off the pre-season on the 24th April. The first league game is Bacup (A) on the 25th. New faces at Church this season include Ammer Mirza, the former Blackburn Northern and current Lancashire U19's opening batsmen, Craig Fergusson who we are delighted to welcome back from Enfield, batsman Phil Howard from Oswaldtwistle Immanuel and all-rounder Mohammed Jamil, a former representative of the Ribblesdale League team also from Blackburn Northern. Last Sunday was the final indoor practice of the pre-season, and senior practice will begin on Tuesday 6th April at 6.30pm for the first outdoor session of the season. ALL SENIOR PLAYERS ARE ASKED TO ATTEND REGARDLESS OF THE WEATHER as there will also be an important meeting for all players in the bar. The teams for friendlies can be found on the team selection page. Tommy Lowe, who captained Church and played for the club 367 times between 1947 and 1975 has died aged 79 after a long illness. Tommy was a popular character who scored 2075 runs and took 526 wickets for the club. He was also the club professional in 1957 and 1958, and captained the Worsley Cup winning side in 1974. We will be holding our annual NatWest Cricket Force day on March 27, in which volunteers are asked to help out in preparing the club for the forthcoming season. It starts at 9.30am and tea and bacon sandwiches will be provided to all attendees. Each year NatWest will sponsor the club based on their assessment of how successful the day has been, so the club are asking friends and families of the club to attend, even if only for a short while. Local firms will be present on the day to assist the club with the work. For more information contact Graham Gaskill on 07762 490090. Ever wanted to know how many wickets you have for Church, how many times you scored 50 or how many times you waddled off after a duck? Well now you can! After a huge amount of work gathering information and inputting scorecards, the Church CC Archive is complete! Every match played since 1892 is covered and with assistance from www.cricketarchive.com, a complete statistical summary for the Club is now available. This includes features such as a complete list of every player who has played for Church together with details of the number of matches played, runs scored, and wickets and catches taken. It is also possible to view batting records, bowling records, highest and lowest scores & partnership records against every Lancashire League club. Special thanks go to lancashireleague.com and Nigel Stockley. This is only the beginning, so watch this space for updates on how we intend to use this brilliant resource. Click here to go directly to the statistics. Church allrounder Sam Holt has been nomintaed for "Young Coach of the Year" in the 2010 Sky Sports Reward and Recognition Awards. Sam is one of only 3 coaches from Lancashire to have had their names put forward as candidates for National Recognition in 3 different categories. The nomination recognises the hard work Sam has put in not only at Church, but in schools around the Hyndburn area. In the last year, since returning from a valuable coaching experience in New Zealand, Sam has used the Chance to Shine initiative to introduce cricket to Primary School youngsters, alongside the work he does with Church. More recently, he has been appointed Community Cricket Development Coach for Rochdale through the Lancashire Cricket Board, where he hopes he will continue to improve his knowledge of grass roots cricket and coaching as a whole. Everyone at Church would like to congratulate Sam for his excellent achievement. Church Juniors continue to practice at Accrington Academy under the guidance of Sam along with Graham Gaskill, Naomi Aspin, Ammer Mirza and Andrew Bentley who all hope to complete their ECB Level 2 course within the next month. The Annual General Meeting for the Cricket Club will be held on Thursday 25th February at 8pm prompt in the Social Club. Club members only will be admitted. Junior training will commence on Sunday 21st February 2010 at 1.30pm until 3pm at Accrington Academy. (Orange Street entrance off Whalley Road). Coaches will be in attendance and all existing and new players are very welcome. Players are asked to bring �1 each week. Any queries, please contact Graham Gaskill on 07762490090. Heroes and Villains brings in 2010 in style! A packed clubhouse of Supermen, Catwomen and Hannah Montana children celebrated New Year in style in the recent Heroes and Villains fancy dress party. Over 100 revellers enjoyed party games and dancing, with DJ Phil Colbert spinning the records until the early hours. A great night was had by all and photographs of the last Player Productions event of 2009 are certainly worth looking up on our Facebook site. It was standing room only in the club on Friday night as Quizmaster Graham "Magnus Magnusson" Gaskill asked the questions in the first of what will surely be a regular club quiz night. Those who scoffed at the less than testing openers were soon put in their place as they racked their brains to find the names of Pat Butcher's husbands (there were 4 by the way) and failed miserably. The half time interval saw Elaine's curry and Graham's chilli/spud pie combo woofed down by the hungry boffins whilst the music round was re-played to enable the quizmaster to dance to the Robyn S classic: Show Me Love (which was the answer to 15). Spot prizes were dished out to the luckiest guessers and the bar was so busy that Blaize and Christine weren't drunk until at least 9.15 (the former had certainly caught up by 3am). Thanks must go to GG for organising a fantastic evening and to those who came and filled the club yet again. Details of the next quiz night will be available soon! The club is delighted to announce that Luke Woodcock will be returning as professional for 2010. Luke has sent back his signed contract and is excited about the prospect of having a full season at Church. Having arrived late in 2009, Woody showed himself not only to be a quality cricketer but a real team player and has followed this up with some outstanding performances back in New Zealand. He has amassed 560 runs at an average of 80.00 in first class matches so far this season and has been bowling regularly in all formats. His best effort with the bat came in his most recent first class match when he scored an awesome 220 not out against Central Districts. He is currently busy with a hectic schedule of Twenty20 and One Day cricket before returning to 4 day action at the end of the February. All at Church are hoping Luke continues his good form through to the end of the season but saves plenty of runs and wickets for West End next summer. Senior training begins this Sunday 7th February 2010 - 12noon til 2pm at Accrington Academy. All players with aspirations of playing senior cricket in 2010 should attend and are asked to bring �3 per session to help cover the cost of the sports hall. New players are welcome and anyone who wishes to play but is unable to attend should contact AB on 07846 106 343 with a good excuse! (my dog ate my box will not be accepted). Heroes and Villains New Years Eve to go off with a bang! "I am massively excited about New Years Eve up at the club" said Tucker, the driving force behind the social revolution at Church. "When we came up with the concept of Player Productions this time last year, our aim was to create social events which would cater for the whole spectrum of the club's membership, but also for those who had never set foot on the ground. We wanted to attract people who may live in the area or are friends of players and members, and let them know that Church Cricket Club is a place where people can enjoy a brilliant night. So far this year, we estimate that our events have been attended by upwards of 250 people and expect this to be well over 350 after New Years Eve." "People have made a real effort to get involved at every event so far and I can't see this being any different. Everyone who was at one of our earlier events will know what a great night this is going to be, and for those who are boarding the West End partybus for the first time - I'm sure they will be back again next year." Tickets for the event are still on sale priced �12.50 which includes food and entertainment, and are available through Sam on 07764 770 900 or by emailing playerproductions@churchcc.co.uk. Senior winter training will be held indoors at Accrington Academy, beginning on Sunday 7th February at 12-2pm, for a period of 10 consecutive weeks. The last indoor session will be on the 11th April 2010. Junior winter training will be held at the same venue from Sunday 21st February until Sunday 28th March 2009, from 2pm - 3pm. Graham Gaskill and Naomi Aspin will be taking their LCB Level 2 Cricket coaching qualification in November at QEQS. Levi Wolfenden, Patrick McDonagh, Danny Dyson and Matt Cook will be taking their LCB Level 1 coaching qualification at Myerscough College in November/December. It has been a groundbreaking year so far for Player Productions and the Church CC social scene, with only 2 more chances to party with the boys in 2009. For more info click here. Phil Sykes has now added the recent missing matches to the club statistics on this website. All matches from 1960 to date are now included, and some prior to this have also been added including the championship winning years of 1939-41. Click here to view this amazing new feature. This is very much a �work in progress� and currently contains scorecards from 1960 onwards although, as yet, some matches cannot be viewed owing to unavailability of scorebooks. We are, therefore, accessing details from other clubs and libraries to fill the gaps. Missing scorecards relate to the years 1971 (nine missing), 1975 (sixteen missing), 1977 (twelve missing), 1984 (8 missing), 1991 (six missing) and 1992 (eight missing). As we locate this information, it will be added to the site. Massive thanks are due to Nigel Stockley for locating and adding old scorecards, Peter Griffiths of Cricket Archive for supplying the software, and to Phil Sykes for his painstaking work in entering the information. 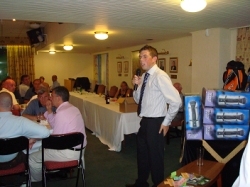 Church CC club captain Phil Gilrane will be hosting the Annual Captain's Dinner on Friday 11th September 09. 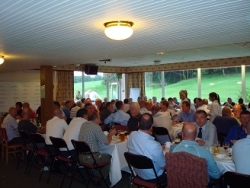 Following the success of last year�s Captain's Dinner, the evening will follow a similar format. Celebrate the last weekend of the season with us. For more info, click here. 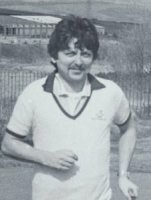 On the 20th September 2009 Andrew Bentley will be running the 13.1 mile Great North Run in memory of former Church player, committee member and supporter, Dad Fred. Andrew is raising money for Cancer Research UK so please support him by sponsoring him at www.runningsponsorme.org/andrewbentley, calling 07846106343 or through Christine behind the bar at the club. Church CC welcome it's youngest new supporter - Freddie Shorrock! Everyone at the club would like to congratulate Barry Shorrock, Lauren Holgate and all the family on the arrival of Baby Freddie Robert, born on the 4th August 2009 weighing in at 8lb 4oz - incidentally the same weight as Barry's bat! Already thought to be picking up his Dad's left handed stance, classical technique and preference of the mid-wicket boundary, we hope young Freddie will be making an appearance up at the WECG very soon. 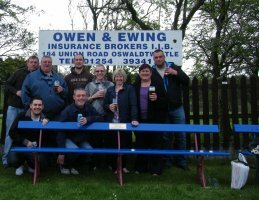 Church will entertain neighbours Oswaldtwistle Immanuel on Friday night in an annual Twenty20 challenge match. This fixture has proved to be an entertaining encounter over the years as the Ribblesdale League side aim to get one over on their Lancashire League counterparts. Church go in to this game on the back of a successful 2009 Twenty20 campaign after winning group A and qualifying for their first ever semi-final in this form of the game. They got within touching distance of the final only to fall short in a dramatic last over which saw Burnley pip Church to the post. We would hope that some enjoyable Twenty20 cricket has brought a few new faces to the club from within the local area, to enjoy the game and a pint, and the club would like to pay special thanks to everyone who has supported us throughout the 2009 campaign. Whilst all the boys were bitterly disappointed to lose on Friday night they will certainly have learned from the experience of playing in front of such a large (and vocal!) home crowd, and it would be great if nights like Friday came around more often. We would like to encourage everyone to come down this Friday night and support both local teams for the last Twenty20 fixture of the summer! Tea Room: open throughout game. Church take on Nelson this Sunday (19th July) at the WECG and need the help of the most loyal supporters in the Lancashire League as they look to return to winning ways. After last weekend's defeat at Haslingden it is safe to say that the lads will be firing on all cylinders this Sunday as they look for a good run of results to get themselves back towards the right end of the table. Following last Friday night's wash out, the semi-final twenty20 match between Church & Burnley at the WECG will now take place this Friday 10th July, wickets pitched 6.15. The bar will be open from 5.30. Admission �2 and �1 for concessions. After Sunday's Worsley Cup semi-final disappointment at the hands of Ramsbottom, Church will be looking to make amends by qualifying for the final of this competition for the first time since its inception 4 years ago. Come along and support the team! 2009 Church professional Luke Woodcock is finally due to arrive on Monday, just in time for a crucial weekend in the club's season. Great news for all connected with the club going into an exciting weekend that consists of 3 consecutive games in 3 days and features 2 cup semi- finals! Woodcock's first game for the club will be a twenty20 semi-final at home to Burnley on Friday following a successful twenty20 campaign with Church winning group A. The team have shown profound improvement in this form of the game this season with a number of comprehensive victories in the group stages. Bacup are the visitors on Saturday in a crucial Lancashire league fixture with the club looking to firmly establish itself as a top half outfit. Sunday is argubly the most important game of the weekend in the club's bid to progress to their first Worsley Cup Final since 2002. The current crop of players have aspirations to emulate the Worsley Cup success of the 1974 team and lift the famous old trophy for the first time in 35 years. Church will travel to Acre Bottom looking to beat Ramsbottom and avenge the 2002 Worsley Cup Final defeat. Church 1st XI needs you! Please click here for further details. Natwest Cricket Force 2009 - Saturday 4th April 9.30am -Your club needs you! Church & Oswaldtwistle Cricket Club's 20 week lottery has numbers available. For more details, click on the link below. Click here to view the teams for the pre-season friendly matches. Church & Oswaldtwistle Cricket Club are delighted to announce the signing of Luke Woodcock as their professional for the 2009 season. Click here for further details. On Friday 8th May, the 1st XI are hosting a 70's fancy dress night at the Club. For further details, click on the links below. On a recent trip to Antigua and Jamaica, Ernie Edwards and Geoff Briggs met up with Church legend Chester Watson. Chester is keeping well and has retired to Montego Bay. The Club has been successful in securing a �10,000 grant from The National Lottery 'Awards For All' for ground maintenance and coaching equipment. The seniors' winter nets commence on Wednesday 4th February at 9pm at Mount Carmel with a senior coach in attendance. The juniors' winter nets commence on Sunday 22nd February from 2pm to 3pm at Accrington Academy, also with a senior coach in attendance. Four players are shortly to attend the Level 2 Coaching Course - Phil Gilrane, Andrew Bentley, Sam Tucker and Stephen Stokes. 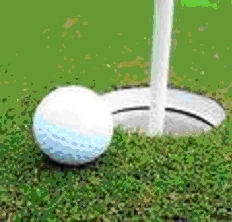 The sixth annual am-am golf day has raised an exceptional amount of over �3,000. Our thanks are due to the outstanding efforts yet again of Fred Bentley backed up by his sons Andrew and Christopher. Prizes were presented by our chairman, Donald Holt. Church Cricket Club thank all sponsors Book early for next year! Our thanks are also due to our generous sponsors and to all the teams taking part. Current professional, Niel Bredenkamp, has announced that, owing to other commitments, he will be unavailable to return next season. On the 13th April 2008, players, members and friends of Church CC completed a distance of 71.2 miles around the 14 grounds of the Lancashire League. The legs between grounds ranged from 11 miles on a bike to 1 mile on foot and everything in between, with each leg being a challenge for all who completed it. All competitors should be proud of what they have achieved, not only in completing their leg but doing so in good time. Particular praise should be reserved for a few competitors who, quite literally, went the extra mile. Firstly, Alison Hargreaves, Graham and Dave Gaskill and Mick Lee who completed particularly lengthy trips. Also to the lads in the junior section who completed the last 2 legs from Enfield to Rishton and Rishton to Church. Earlier in the morning, one of our longest serving members Mrs Kitty Ward completed the 1 mile trip from Accrington to Rishton. This is a great achievement I�m sure you will all agree. Mrs Ward actually requested a longer leg and is now the leading contender for the Todmorden to Bacup trip next year! The efforts of all these people typify what the club is all about. We are hugely grateful to the three companies who sponsored this event, i.e. Greengates Builders Merchants Ltd, Emerson Process Management and Loftworks. Their support is much appreciated and details of their businesses can be found on tables around the club and behind the bar. 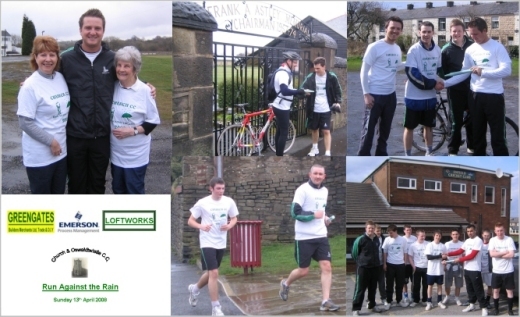 All who took part in the run have helped raise funds for the club by collecting sponsor money from family, friends and colleagues, and worked hard on the day to complete whichever leg they selected. If you are reading this and are yet to sponsor a member or the run as a whole, please be generous and pledge a sum to support our cause as we look forward to a great season. Runners taking part were Phil Sykes, Graham Gaskill, Jonathon Leach, Andrew Bentley, Adam Greenwood, Liam Brankin, Mick Lee, Dave Gaskill, Alison Hargreaves, Peter Rowbottom, Sam Tucker, Phil Gilrane, Niel Bredenkamp(Club professional), Sagawat Hussain, Kitty Ward, Kath Walmsley, Sam Holt, Luke Gilrane, Alex Richmond, Danny Dyson, Joel Gaskill, Edson Beck, Matt Cook, Dave Gilrane, Levi Wolfenden, Danny Palmieri, Sam Cox, Harry Lowe, Zain Ali Akbar, Junaid Mahmood, Amza Hussain, Sam Etherington, Jack Cox, Ryan Sanderson, Jacob Whitcombe, Jack Gaskill, Saul Hayden, Liam Dyson, Jarrod Haworth, Anthony Sanderson, Alec Holt, and Tracey Angus. Many thanks to everyone involved. The Club wishes to thank Bedfords of Blackburn Ltd for the sponsorship of club cricket shirts and 1st XI 20/20 shirts. For further details of Bedfords of Blackburn Ltd, click here. The Club is pleased to announce that the 1st XI captain for the 2008 season will be Philip Gilrane. Philip, who replaces Phil Sykes, is aged 24 and is a Level 1 coach concentrating upon the Under XI's for the last 6 years. We thank Phil Sykes for his several years' service as captain, and wish Philip Gilrane much success in his new role. Captain for the 2nd XI will be Peter Rowbottom, and Steve Stokes will be skipper of the 3rd XI. The local history section at Accrington Public Library now has a great of Church CC's history available on CD. For more information, call Catherine Duckworth on (01254) 306911. Ron Freethy, the well-known author of many books and articles on nature studies, is due to produce a book on the Lancashire League. Has has taken a great deal of interest in the League's history, and has written about the clubs in the Lancashire Evening Telegraph. The book, now in process, will be published in 2008 or 2009. It will be a minimum of 70,000 words and will be extensively illustrated. It will be availbale from the clubs in addition to the bookshops. Mr Freethy is busily engaged in gathering information from the clubs of the Lanacshire League, and would be delighted to hear from anyone with League memorabilia or with memories of the League in days gone by. He can be contacted on (01200) 440212. New League Record - Almost! During the Burnley v Church match, Ruvin Peiris scored 122 not out, and Phil Gilrane hit his maiden half century to establish a new batting record for the League for the seventh wicket - only for the rain to arrive and wash out the game (and the new record). 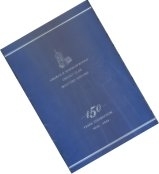 A brochure has been printed to commemorate the 150th anniversary of the Club. It contains articles including a potted history of the Club through to the 2005 season, and includes updated records and statistics. It's a must for all followers of the Club, and can be obtained at a cost of �5 including postage and packing.